Eleanor Taylor is an award-winning illustrator. She lives in England. The tale-behind-the-tale preludes are intriguing—perhaps especially to big fans and those interested in the writing process—but the stories themselves shine brightest here. Taylor's illustrations, sometimes cartoonish, sometimes more abstract and moody, cast the Almondine experience in yet another new light. 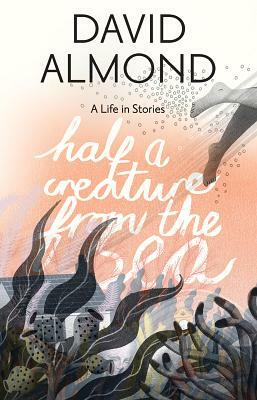 This is powerful, top-notch storytelling from Almond, who seems himself to be the titular "half a creature from the sea," in that he, as ever, fluidly blends past and future, the living and the dead, the ordinary and the transcendent. Beyond offering eight alluring epiphany stories (most previously published elsewhere), Almond (The Tightrope Walkers) provides a rare glimpse into the writer’s imagination and the process of creation. The sights, sounds, smells, and emotions evoked in these stories will long resonate with readers and act as reminders of the joys, tragedies, and magic of childhood. The author delivers realistically magical vignettes for niche readers. A unique contribution to the rather small genre of young adult short stories. Almond’s dialogue crackles with Briticisms and youthful English dialect. His scenes center on unsuspecting young adults making sense of mystical situations they unwittingly encounter. With each story, Almond cements his prolific, beloved place among writers of magic realism for today’s young readers. While the fictional stories are equally invested in the marriage between the mystical and the earthy, Almond also brings a luminous quality to the biographical bits that will encourage readers to rethink the wonder of their own lives and to see what’s just outside their windows with new eyes. Dark and haunting, Almond’s narratives evoke feelings of longing, suspense and horror, as well as a bit of hope and wonder. This title would be a welcome addition to middle and high school short story collections.